University Orthopedics announces the addition of Chris Got, MD, and Scott Paxton, MD. August 1, 2013 — University Orthopedics would like to announce the addition of Chris Got, MD, and Scott Paxton, MD. Dr. Got will be joining the Hand Division and Dr. Paxton will be in Shoulder and Elbow. The addition of new surgeons is part of University Orthopedics’ ongoing efforts to improve patient access. Patients can request appointments online by clicking here. Physicians can refer a patient by clicking here. In addition we have made it easier to refer patients and schedule appointments with our central scheduling service at 401-457-1500. 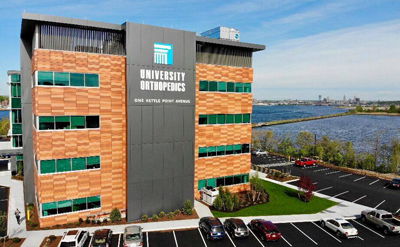 Please join us in welcoming Dr. Got and Dr. Paxton to University Orthopedics and University Physicians, Inc.
Christopher Got MD graduated with AOA honors from University of Medicine and Dentistry of New Jersey – New Jersey Medical School in his home state. He then moved to New England and completed his orthopaedic surgery residency at Brown University. He continued his training with 2 additional fellowships one in Orthopaedic Trauma at Brown University and another in Hand, Upper Extremity and Microvascular Surgery at Harvard University – Brigham and Women’s Hospital. Dr. Got currently holds an academic appointment of Assistant Professor at Brown University - Warren Alpert Medical School. He has special interest in upper extremity trauma, joint replacement, nerve compression syndromes and arthroscopy. Both his peers and hospital administration have recognized him during his training for his exceptional leadership and patient care, receiving both the Most Valuable Resident and the Haffenreffer Housestaff Excellence Awards. He has participated in both clinical and basic science research projects funded by the NIH and the American Society for Surgery of the Hand – ASSH/AFSH. He has authored a multitude of articles, book chapters and national or international presentations. Scott Paxton, MD is a member of the Division of Shoulder and Elbow Surgery and an Assistant Professor of Orthopaedic Surgery in the Department of Orthopaedic Surgery at the Warren Alpert Medical School of Brown University. He completed fellowship training in the treatment of problems of the shoulder and elbow at the renowned Rothman Institute in Philadelphia where he trained with many of the world's leaders in shoulder and elbow surgery. The typical problems that he evaluates and treats include rotator cuff tears and impingement, shoulder and elbow instability and dislocations, shoulder and elbow arthritis, shoulder fractures (humerus, glenoid, scapula, and clavicle), elbow fractures, malunions and nonunions of these fractures, tendon injuries of the shoulder and elbow, labral tears, throwing injuries and other sports injuries of the upper extremity. Dr. Paxton is an attending surgeon at Rhode Island Hospital and The Miriam Hospital, and a consultant at the Providence V.A. Medical Center. In addition to treating patients, he is actively involved in research and education of present and future orthopaedic surgeons, including medical students, residents, and fellows. He is also involved in research related to shoulder and elbow disorders and has presented and published many papers in his field.